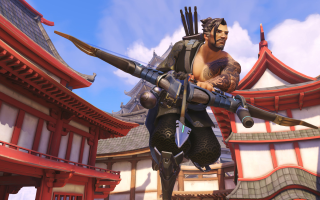 Yet more Overwatch footage, as Blizzard reveal unedited footage of a match as Hanzo. He's the archer of the game's cast, and seems plenty nimble thanks to the ability to climb walls. Also, he can fire a big ghost-dragon at people. That is not a bad skill, as these things go. Oh, and that blue orb thing? That's a tracking arrow that makes it easier for your team to see enemies within its radius. This is the fourth character playthrough that Blizzard has released. Previously, we've seen Mercy, McCree and Zenyatta.